Windsor Arena, also known as The Barn and The Border Cities Arena was the preeminent arena for Windsor. It was most well known for being the home of the Windsor Spitfires until they moved to the WFCU Center in 2008. Prior to housing an arena, the lot held a house and a coal yard. This was removed, and then land was taken over by the Border Cities Arena Company and who opened the arena in 1925. The arena was built at a time when in-door arena was considered a state of the art facility. The it had a few events prior, The Border Cities Arena officially opened in November 26th, 1925 on a night when over 7200 people crammed into the stadium (capacity in the early 2000’s was listed as being 4,400) to watch the Stanley Cup Champion Victoria Cougars take on the New York Americans of the NHL. The Victoria Cougars would play many games there, including the entire 1926-27 season as they had moved to the area and became the Detroit Red Wings. The Wings would often play in Windsor while waiting for the building of the Detroit Olympia. The Toronto St. Pats played their last game at the arena in 1927, losing 5-1 to the Cougars in Windsor, before being rebranded the Toronto Maple Leafs. The Border Cities Arena Company was reorganized under the name Windsor Arena Ltd in 1946. It was at this point that the well known Butcher Brothers, of Butcher Engineering Ltd. Took over and operated the rink under the Windsor Arena name. The arena was nearly turned into a curling club in the 1960’s, as due to failing health the Butcher Brother’s were looking to sell. The Windsor Bulldogs hockey team was no more, and hockey was set to be a thing of the past at that location. However, a group of 7 local businessmen instead purchased the arena for a figure under $300,000. This group was headed by then Windsor Bulldogs captain and real estate agent Lou Bendo. Also in the group were Windsorites Bill Baksi, John Partyka, Bruno & Ed Rossini, and Detroiters Sam Fox and Jack Marx. They bought the arena and recreated the Bulldogs. They also rented out ice to the Windsor Minor Hockey Association, and demand for ice time was such that they were able to rent out and fill 24 hour time slots over weekends in the 1960s. By 1983 Windsor Arena was one of only 4 privately owned Arenas in Canada. Along with Maple Leaf Gardens, London Gardens, and the Montreal Form, it was uniquely operated. This ended in 1990, when the arena was sold to the Corporation of the City of Windsor for $750,000. The municipality further upgraded the building, adding stucco to the building’s exterior and adding seats from the defunct London Gardens in 2002. 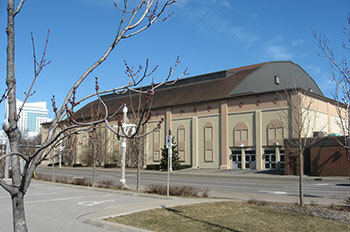 The Windsor Spitfires would play their last game at “The Barn” on December 4, 2008. The University of Windsor Lancer’s men’s and women’s teams took over the space from 2009-2012, and by 2014 the arena was being used as a warehouse for salt. The last hockey game took place in March of 2012. The location of the arena is now slated to become the new location for Catholic Central High School.